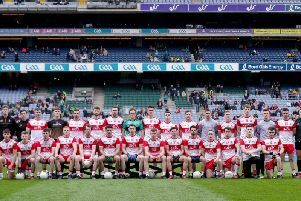 Down brought the curtain down on Derry’s senior hurling season after three second half goals sent the Oak Leafers out of the Ulster Championship at Owenbeg on Sunday. Derry had recovered from a lack lustre start to lead by two points at the interval before the Mourne men hit them with two goals in three minutes upon the restart and added a third 10 minutes later. With Danny Toner superb in a free role for Mickey Johnston’s visitors who seemed determined to win the physical battle, they will now go forward to meet Antrim in the provincial decider. The game started with an immediate yellow card for Down’s Michael Hughes who was fortunate to only receive a booking for careless use of the hurl which saw him catch Aaron Kelly in the face after only 45 seconds. Ruairi Convery’s subsequent free was drifting wide but brilliantly plucked out of the air by Alan Grant who returned possession to Convery who was take out of it unceremoniously by Conor O’Neill who became the second Mourne man into Owen Elliott’s book with only 2 minutes gone. Paddy Henry eventually scored the free but the challenge forced Convery off with a suspected broken collarbone, the Swatragh man being replaced by Paul Cleary. The Derry lead didn’t last long though as Gareth ‘Magic’ Johnson sent a shot between the posts upon the restart before doubling his tally from a 10th minute free after Conor Quinn had picked up the game’s third booking for a challenge on Caolan Bailie. The lead was 0-3 to 0-1 when Bailie himself sent over a nice shot from the right and at this point Derry seemed to be having difficulty getting into the game. Convery’s departure had seen Grant moved deeper but it was Down who were winning the challenges. Aaron Kelly exacted a dose of revenge on Hughes that saw him become the fourth player booked on 23 before the game went into a scoring frenzy which saw 11 points in seven minutes. Paddy Henry kicked things off with a nice point but for every Oak Leaf score the visitors found a response.James Coyle got his first score of the day but just as quickly as the scoreboard operator could register that point, Paul Cleary had split the posts at the opposite end. And so it went on. Down’s Declan McManus saw his score cancelled out by Aaron Kelly as Danny Toner then hit three in succession for Mickey Johnston’;s team but Henry, Sean McGuigan and Henry again (free) left it 0-8 to 0-7 in Down’s favour as the game hit the half hour mark. Jonathan O’Dwyer then set Cleary up to level the game and having played second fiddle for most of the half, Derry finished the stronger with two further Paddy Henry frees to go in two ahead at 0-10 to 0-07. Derry’s impressive end to the opening half was in stark contrast to their start to the second as Down plundered 3-05 inside 11 minutes to effectively kill the game. First a superb run in off the right by Steven Dineen ended with Daryl McDermott saving well only to see the ball drop perfectly for Bailie to scoop into the empty net. Johnson added a free but disaster struck for Derry seconds later when Toner speculative shot was dropped into his net by McDermott to leave the visitors 2-09 to 0-10 ahead. Kevin Hinphey got Derry’s first score of the second half after another Johnson free but two further Toner frees brought Down tally to 2-12 just before the visitors claimed their third major of the game with a carbon copy of the opening goal. Again strong running from Dineen was the catalyst and once again McDermott produced an excellent stop. However this time it was ‘Magic’ Johnson in the right place at the right time to bundle the ball into the net for 3-12 to 0-11 with only 46 minute on the clock. Derry never recovered. Tom McLean’s men improved and did claim the goal of the game on 56 minutes when Alan Grant’s sideline cut was plucked out of the air brilliantly by Kevin Hinphey who then turned and found the top corner from 20m but they never looked like finding the net again. Down were able to drop men back and Derry found it difficult to get the ball to stick among the forwards which allowed the visitors to maintain a degree of control until the final whistle. Down: Stephen Keith; Sean Ennis, Ryan Brannigan, Michael Hughes; Declan McManus (0-1) Conor O’Neil, Michael McCullough; John McManus, Donal Hughes; Steven Dineen, Danny Toner (1-7, 1f), Toner, Fintan Conway; Caolan Bailie (1-1), Gareth Johnson (1-6, 4f, 1 sixty-five), James Coyle (0-1). (Subs) Brett Nicholson for R Brannigan, 9mins (B/S - reversed 12mins); Conor Cassidy for J Coyle, 47mins; Paul Sheehan for C Bailie, 57mins;Scott Nicholson for D McManus, 71mins.